The altheisure superstar set the bar for digital-first retail when it launched in 2013 and its intelligent data-driven personalization has been growing steadily -- valuing the company at $235 million. Fabletics warmly onboards new customers into its VIP member program with an in-depth lifestyle quiz built around the user’s workout preferences, jumpstarting its personalization strategy at first touch. The brand takes a holistic approach, with recommendations evolving over time as a customer continues to engage. Fabletics announced last month that it plans to quadruple its international retail presence by opening 75 new locations. The stores will incorporate innovative personalization with digital tech, a selfie wall, and a leggings bar in its pilot store in Washington. The fast-fashion brand’s current retail stores are experiencing 20 percent in year over year same-store sales and the announcement suggests that millennials and Gen Z value digital personalization when it’s applied to an in-store experience, expecting a seamless experience that Fabletics consistently delivers. 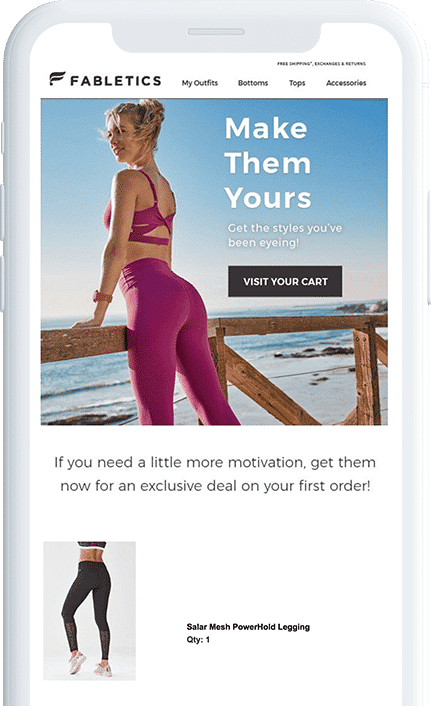 Fabletics’ marketing messages include both interest- or attribute-based recommendations, and the brand’s emails are full of them, making it easy to find (and buy) something in every campaign send. The interest-based approach means that recommendations get smarter over time, including the ability to personalize based on omnichannel behaviors in previous seasons so the brand isn’t using data from your winter boot-buying spree when it comes time to recommend strappy summer sandals. Like other TechStyle brands JustFab and ShoeDazzle, Fabletics kicks things off with a quiz to learn more about customers’ exercise habits and product preferences. The lifestyle quiz serves as a jumping off point for personalization… and offers shoppers extra credit in the form of two pairs of leggings at a steep discount. 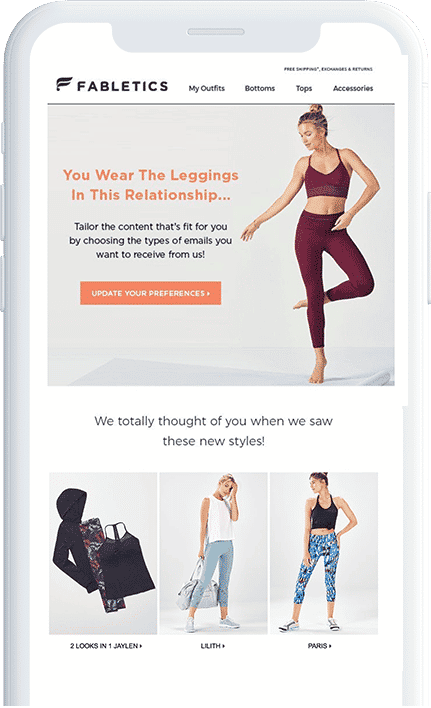 Part of Fabletics’ solid email strategy includes personalizing email send time on the individual level. Rather than blasting everyone at the same time, Fabletics takes a shopper’s historical behaviors into consideration, personalizing its send time to when customers are most likely to open and engage.